Humana has been promoting for three years the social and urban agriculture program "Cultivating Climate and Community (3C)". It is an ideal tool to work together with some of the collaborating municipalities of the Foundation. Some of them wish to complement the activity of collecting used textile for social purposes carried out with the implementation of a 3C project in its municipal term. It also represents a support for the neighbors and a place to share experiences and knowledge. It is a program that seeks to harness the resources of the land to generate products of self-consumption at the same time that it reinforces the social and community bonds. The objective is to work with people who seek to create a community, to integrate into a local project and who wish to promote organic farming and respect for our environment. It is intended that the activists be self-sufficient, capable of having their own orchard when they stop having technical assistance and obtain self-consumption products. The project lasts two years, at the end of which a new cycle begins with new activists. 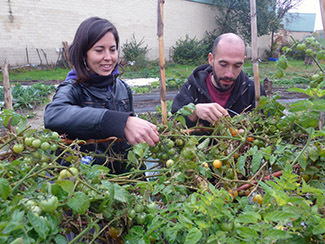 In the case of Leganés (Madrid), the social orchard now closes a stage and begins a new cycle: on Saturday, November 26, a farewell ceremony was held for participants and activists who, since 2014, have worked their plot to obtain fresh and organic vegetables. Instead, new neighbors will begin their participation in the project in January, that is: they will receive the theoretical and practical training necessary to maintain their plot and obtain seasonal products in an ecological way. One of the features of the program is that the promotion of activists changes every two years. The production of the social garden of Leganés, located next to Humana's used textile sorting plant in the Polvoranca industrial estate, is dedicated to self-consumption. However, during these almost three years surplus vegetables have been generated that have been delivered to the social dining room Paquita Gallego, next to the orchard and managed by the Madre de la Alegría Association. Most of the activists are residents of Leganés although there are also users from other municipalities. In particular, a parcel of land is reserved for users of the Libelula Association of Fuenlabrada that works with homeless people; Since 2014 five people of this entity have already passed through the orchard. Each plot allows to produce food for a family of 5 members. The profile of the activists is varied, and so is their age (there are people from 67 to 10) and their motives. 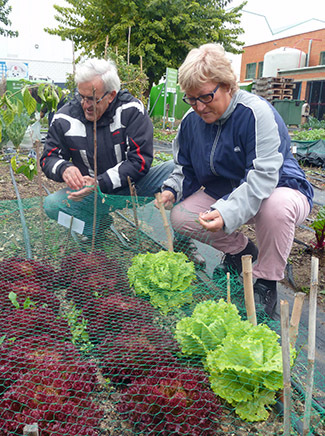 Juan Jose Osuna, 66 and a neighbor of Leganés, explains why he got involved in the social garden: "I had to retire forcedly even though I considered myself young. The garden has served me as evasion and therapy. Beyond the rich vegetables we produce, what I like is the process of cultivation, enjoy a creation of yours and nature. It also keeps you physically active. My grandchildren come in from time to time and learn that vegetables are not born on a super shelf but on earth. " Carlos Cuéllar, 62, also a neighbor of Leganés, praises organic vegetables: "The tastes are tremendous, they have nothing to do with what you can find in a store. My mother said that the tomato was the ham that was born from the earth ... and did not exaggerate: You test a tomato coming out of the orchard and it's like eating jabugo ham! " 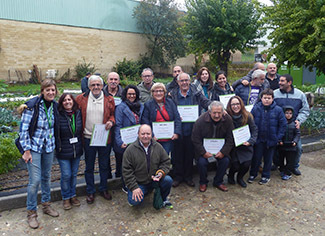 During the event, 3C's manager, Damiana Conde, pointed out that Humana's social garden in Leganés has fulfilled the objectives of "learning to be self-sufficient, respect the environment and work as a team. All together we have given life to a lonely and barren land, "he recalled," and now a new team of people will continue to give life. " At present, the program includes social gardens in six municipalities: Leganés and San Agustín del Guadalix (Community of Madrid) and Cornellà, Tordera, Lliçà d'Amunt and Calella (Catalonia), with a total of 300 activists. Two more municipalities will soon be added: Palau-solità i Plegamans in Catalonia and Alcalá de Guadaíra in Andalusia.